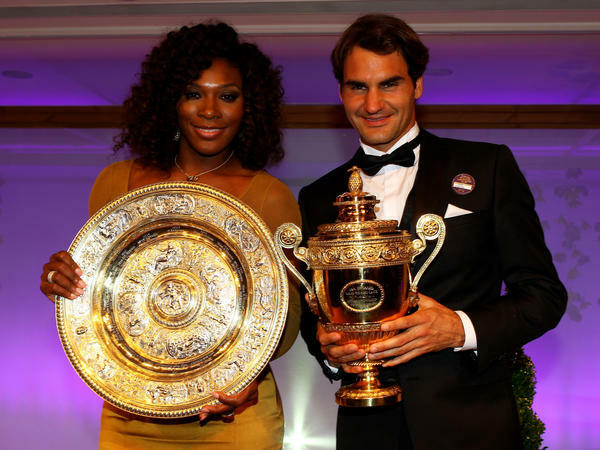 Serena Williams and Roger Federer, shown here at the Wimbledon Championships 2012 Winners Ball, are set to play each other at a mixed doubles match on New Year's Day at the Hopman Cup in Perth, Australia. On New Year's Day, two of the greatest tennis champions ever will stride out onto a court in Perth, Australia, and play each other for the first time. Serena Williams and Roger Federer have been on the international tennis circuit for decades — both are 37 years old — and they have won 43 Grand Slam titles between them. "I've always thought, 'How is it to return that serve, or to go head to head with her?' " Federer said, according to Tennis.com. They'll meet in a mixed doubles match at the Hopman Cup. Williams, representing the U.S., will play with Frances Tiafoe, while Federer will compete alongside Swiss player Belinda Bencic. The match has been compared to the 1973 exhibition match known as Battle of the Sexes, where Billie Jean King roundly beat Bobby Riggs. Both Federer and Williams say they're excited about the historic matchup. Williams has called it a "dream come true," the BBC reports. "I have been looking forward to it. This is so cool." As Tennis.com notes, Williams said: "You know, I've been training in the off-season to be ready for Roger. I'm not sure how I'm going to do, but we'll see." Federer stressed that both players are looking for victory. "I admire everything she's done on and off the court, we are both fierce competitors and we always want to win," he said, according to Agence France-Presse. "It is going to be one time, probably never again. She is one of the biggest champions in our sport ever, men and women combined, so it is great to be playing against her," Federer added. "I don't know her very well," he said. "In the corridors and cafes, walking by each other, sometimes in the past she has asked me how are the kiddies and how is everyone doing, but if I said I know her it would be a bit of an exaggeration." At the Hopman Cup, eight teams representing their nations compete in a round-robin format. Competitors play a men's and women's singles match along with the mixed doubles match. Williams defeated Greece's Maria Sakkari on Monday in her first tournament appearance since she lost to Japan's Naomi Osaka in September's controversial U.S. Open Final. During the final against Osaka, Williams received multiple penalties from umpire Carlos Ramos. In an escalating argument, she called him a "thief" and accused him of stealing a point from her. Some commentators have suggested that Williams was penalized unfairly due to sexism and racism. Federer also won his first match of the Cup on Sunday, easily defeating Great Britain's Cameron Norrie, 6-1 6-1. He and teammate Bencic are the defending champions at Hopman. Federer also won 17 years prior to that victory when he teamed up with tennis star Martina Hingis.